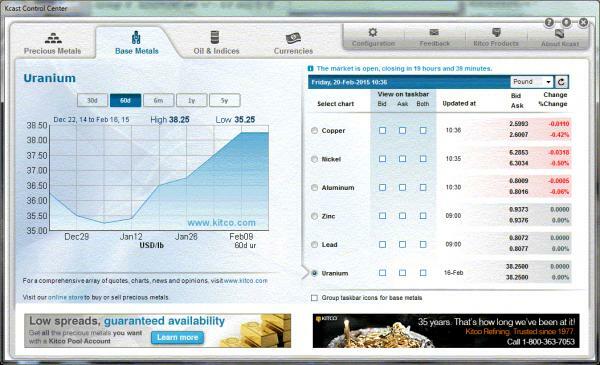 In case members haven't noticed: Kcast from Kitco has added Base Metals to its menu. Charts on offer include Al, Cu, Ni, Pb, Zn and Uranium. In post-war USA, Ã¢â‚¬Å“Skunk WorksÃ¢â‚¬Â was Lockheed MartinÃ¢â‚¬â„¢s near-autonomous research and development group that gave the country products like the Ã¢â‚¬Å“U-2Ã¢â‚¬Â spy plane or the Ã¢â‚¬Å“SR-71 BlackbirdÃ¢â‚¬Â, pushing technology to limits no one else had dared to explore before. A Ã¢â‚¬Å“Skunk WorksÃ¢â‚¬Â team headed by Thomas McGuire, MIT graduate and aeronautical engineer at a division humbly named Ã¢â‚¬Å“Revolutionary Technology ProgramsÃ¢â‚¬Â recently presented their new Ã¢â‚¬Å“Compact Fusion ReactorÃ¢â‚¬Â (CFR), a device which Lockheed claims will be small enough to fit on an eighteen-wheeler and be capable of providing enough power for a city of a hundred thousand people. Nuclear fusion is, in a way, the opposite of nuclear fission, the process used in nuclear power plants around the world today. Nuclear fusion has been a long-time dream of scientists, oft attempted but never accomplished, the challenge being to obtain more energy from the reaction constantly than is afforded to run it. ItÃ¢â‚¬â„¢s, as Lockheed points out, what the sun has been doing for us for a very long time. Magnets used for plasma confinement, although secret in their individual composition, are likely to contain significant amounts of magnetic rare earth elements such as neodymium. In simple words, this is how nuclear fusion works: two hydrogen isotopes, in this case deuterium and tritium, are released into a container under vacuum. When a sufficient amount of energy is added, the gas breaks up into ions and electrons, creating Ã¢â‚¬Å“plasma.Ã¢â‚¬Â This plasma is incredibly hot; too hot for the containment vessel to withst and. Therefore, very strong magnets are used to prevent it from touching the container walls. This, in theory, causes the ions to collide and fuse together. The process then frees up neutrons that carry the released energy through the magnetic field to the reactor wall, where heat exchangers make it usable to power a turbine generator. 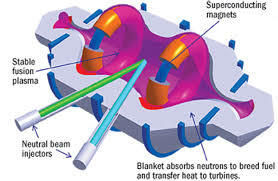 To be clear, what the Lockheed team achieved so far is to contain the plasma within the magnetic field. They did not accomplish an Ã¢â‚¬Å“ignitionÃ¢â‚¬Â of the reaction which is the self-sustaining reaction required to make a practical energy source. This latter part is considered the much bigger challenge according to those who have failed. McGuire is optimistic, though: Ã¢â‚¬Å“We would like to get to a prototype in five generations. If we can meet our plan of doing a design-build-test generation every year, that will put us at about five yearsÃ¢â‚¬Â¦,Ã¢â‚¬Â he said in an interview. If all goes well, the technology may be ready for production in about 10-15 years. Has the energy crisis been solved? Of course it is too soon to tell Ã¢â‚¬â€œ despite the demonstrative optimism the Skunk Works team has a long way to go. One thing is clear: if they win, technology metals win. China to Need 1,000 Nuclear Reactors as Part of Climate Pledge? Sunday November 23, 2014, 9:45pm PST China could need about 1,000 nuclear reactors, 500,000 wind turbines or 50,000 solar farms as it gears up to fight climate change. Currently, 23 nuclear reactors are built in the country, with a further 26 under construction. Are Uranium Stocks Being Unfairly Punished? Ã¢â‚¬ËœI guess the market thinks you can put oil in a nuclear reactor,Ã¢â‚¬â„¢ said Steve Todoruk, who joined Sprott Global Resource Investments Ltd. in 2003. During the first seven months of the year, oil stocks were the darlings of the market, and many investors were recognizing significant gains on their oil positions. During most of that time, uranium prices continued to fall, eventually bottoming out at $28 per pound5, and uranium stocks were generally hated. Right around the time that oil prices started falling, uranium spot prices started to rise. Usually, resource stocks rise in tandem with their underlying commodity, sometimes more rapidly due to their leverage to the commodityÃ¢â‚¬â„¢s price. So why did uranium stocks take a dive along with oil, when the price of uranium itself rose? What appears to have happened is that investors dumped their energy stocks in an effort to lock in their oil stock gains when oil prices began to fall. Uranium stocks were simply caught in the sell-off. The demand for uranium is in fact well-insulated from the price of other power sources, at least in the near and medium term. You canÃ¢â‚¬â„¢t re-fit a uranium power plant to use oil. The price of oil would have to remain low for so long that existing reactors could be taken off-line and new oil-fueled plants could be built to replace them. Because the cost of uranium is very low relative to the cost of building the plants, itÃ¢â‚¬â„¢s unlikely that existing plants would simply be switched off. In the long term, I donÃ¢â‚¬â„¢t think that oil will remain so cheap that it will make sense to replace nuclear power with oil-generated power. This irrational selling in the uranium stocks has created, in my opinion, a buying opportunity. When oil prices level out and the panic selling has subsided, I suspect that value investors will notice that uranium stocks are oversold and undervalued, possibly buying into them and driving them back up to where they were trading prior to when oil began its decent. IÃ¢â‚¬â„¢m not expecting to see uranium stocks lift off and go to much higher share prices immediately, because I still believe that the cyclical upturn in uranium prices will be a long, slow process. Still, a reversal back to the share prices we saw earlier this year in uranium stocks may offer attractive short-term gains. American defense and advanced technology company Lockheed Martin (NYSE:LMT) announced last week that it has taken a revolutionary step forward in the field of nuclear fusion. The breakthrough, the company claims, could solve the worldÃ¢â‚¬â„¢s energy crisis. To test its theory, Lockheed will be building and testing a compact fusion reactor in less than a year. Checking in at about 10 times smaller than current reactors, Lockheed hopes to develop and deploy new compact fusion reactors in as little as 10 years. Still in the experimental phase, nuclear fusion happens when two kinds of hydrogen atoms (deuterium and tritium) come together at high speeds, forming new atomic molecules known as ion plasma. Lockheed is working on magnetic confinement techniques to reduce the size of nuclear fusion reactors. With its compact design, the company has found a way to constrain the plasma within a specifically shaped magnetic field. The magnetic field works to contain the expanding plasma, effectively making it so that the plasma works to contain itself. If successful, Lockheed MartinÃ¢â‚¬â„¢s compact fusion reactor could change the energy landscape as we know it. As CNET explains, one of the most interesting features of LockheedÃ¢â‚¬â„¢s announcement is the size of the reactor. At the size of a Ã¢â‚¬Å“large truck,Ã¢â‚¬Â the company has said its reactor could be built in a factory and shipped around the world. Ã¢â‚¬Å“Our compact fusion concept combines several alternative magnetic confinement approaches, taking the best parts of each, and offers a 90 percent size reduction over previous concepts,Ã¢â‚¬Â said Tom McGuire, compact fusion lead for Skunk WorksÃ¢â‚¬â„¢ Revolutionary Technology Programs, in a company statement. Nuclear fusion isnÃ¢â‚¬â„¢t a new technology by any means. It just hasnÃ¢â‚¬â„¢t been perfected yet. But that hasnÃ¢â‚¬â„¢t stopped LockheedÃ¢â‚¬â„¢s McGuire from moving forward. Ã¢â‚¬ÂWe can make a big difference on the energy front,Ã¢â‚¬Â McGuire said, noting that fusion is safer and more efficient than current reactors based on nuclear fission. The company anticipates being able to complete, design and build its reactor in as early as a year. From here, the countdown looks to be about 10 years to produce an operational reactor. So whatÃ¢â‚¬â„¢s missing? Lockheed has been working on the secretive Skunk Works compact reactors for roughly four years and has chosen this time to go public in hopes of finding government and industry partners. With the added partnership, the dream could soon be a reality in the race to redefine energy as it is today. The soon-to-be-published Action Statement makes seven recommendations to progress nuclear as an energy option for Australia: a comprehensive business/economic analysis should be undertaken; alternative energy scenarios to the 2030-2050 timeframe should be evaluated; and active and open community engagement should commence, while a review of current policies that preclude its consideration is carried out. Current educational and training activities should be built on, including through secondments. It also recommends that regulatory requirements should be examined to determine the actions needed. Lastly, it calls for a strengthening of Australia's current overseas R&D program linkages, for example in thorium fission and hydrogen fusion. China National Nuclear Corporation (CNNC) and China Three Gorges Group (CTG) have signed a strategic cooperation agreement to invest in domestic nuclear power projects, and to promote the inland Taohuajiang nuclear power plant in Hunan province. CTG developed the huge Three Gorges hydropower project, now operated by its subsidiary China Yangtze Power (CYPC). CTG already holds 20% of the CNNC project company set up in 2007: CNNC Hunan Taohuajiang Nuclear Power Co Ltd (CNNC 50%), which is ready to build one of the first big inland nuclear power plants Ã¢â‚¬â€œ four AP1000 reactors. However, the new agreement signals CTGÃ¢â‚¬â„¢s substantial entry into nuclear power. Collaboration domestically will be between subsidiaries CNNP and CYPC, while international nuclear and hydropower goals would be pursued at higher level. In addition to new reactor projects, CTG has agreed to invest in ChinaÃ¢â‚¬â„¢s nuclear power supply chain, including participating in CNNC's nuclear fuel operations, and on the R&D front promote development and construction of the demonstration fast reactor project. This is evidently the twin Russian BN-800 plant planned for Sanming, in Fujian province, where CNNC has the major stake in the project company. RussiaÃ¢â‚¬â„¢s NIAEP-Atomstroyexport expects contracts for the actual plant to be in place about the end of this year. There is another interesting angle on the new China hydro-nuclear agreement. In September 2010 CYPC invested in EuroSibEnergo, a large private Russian hydropower company, and is exploring the potential for importing Siberian hydro power. The main assets of EuroSibEnergo are close to ChinaÃ¢â‚¬â„¢s border and the company is negotiating to export power to the northern and northeastern provinces of China where prices are higher. This is within the terms of a 2006 Russian-Chinese Intergovernmental Agreement which provides for export to China of up to 20 billion kWh per year by 2020. Eurosibenergo supplies RUSAL, the worldÃ¢â‚¬â„¢s largest aluminium smelting company - both companies are in the En+ group. The nuclear industry needs to satisfy the multi-criteria approach to risk that banks take when they decide whether to invest in a large infrastructure project. Only then, can it expect to attract this form of financing to nuclear new build projects, writes Ron Cameron. Specifically, banks look for long-term certainty on price, stable government policy, industry reputation, regulatory certainty, the process for addressing planning and environmental issues and public acceptance, in addition to the economics of the project. European wholesale electricity markets are currently not favourable to nuclear power, however. That's because the role of nuclear in offsetting the negative effect on price of feed-in tariffs and grid priorities for renewable forms of energy is not adequately recognised. The cost to the system of having intermittency of supply is often borne by the nuclear plants through their role in providing back-up generating capacity or otherwise by the consumer through higher electricity prices, subsidies or taxes. With no level playing field for nuclear in liberalised electricity markets, there is a real difficulty in seeing where nuclear new build is going to come from in Europe, without government action. We need to explicitly recognise the advantages that nuclear power provides to stabilise these markets long term, to support the move to a low carbon economy and to help with security of supply. Through its Electricity Market Reform (EMR), the UK government is essentially agreeing to regulate a liberalised market. There is a strike price and contracts-for-difference in the EMR not only for offshore and onshore wind and solar, but also for nuclear power. And there will be a capacity market for the electricity that's left. Through these mechanisms, the UK is trying to do something about the market disadvantage which is keeping investors away from nuclear. If there is no opposition from the European Commission and these structures are proven to work, potential investors will be able to expect certainty of a return. Fortunately, the UK's market mechanism policy has cross-party support; since without a supportive energy policy, it's very unlikely that a bank will come in and fund a project knowing that the next government might change that agreement. Other countries, too, are making clear that the State is behind nuclear new build. For example, in the US, new nuclear power plants are being built with loan guarantees and tax credits. These enable the industry to build a track record of successful projects, which is really the key to attracting banks to a financing arrangement. Other mechanisms are seen in Finland - where large industrial companies are willing to join together to fund the cost of a new-build nuclear program in return for receiving electricity at cost price - and Russia, where Rosatom offers new nuclear countries build-own-operate agreements. "Our focus should be on trying to get banks into plant life extensions." Banks are reluctant to become involved with first-of-a-kind projects, whether that concerns a new reactor technology or a country embarking on nuclear power for the first time. Our focus then should perhaps be on trying to get banks into new projects at existing sites, such as plant life extensions. The latter is a lower risk process because the banks would be funding the cost of upgrades needed for plants whose construction costs have been essentially amortized and yet which could run for another 20 years. And there are usually no great public concerns attached to life extensions, since the plant has already operated for some time. If the banks got involved with those and became familiar with nuclear industry issues, then they could one day be willing to join a consortium in new build projects. Banks look particularly at the track record of the industries that they are working with. And of course there is always the concern of delays for them. So some certainty that the government is behind these projects and prepared to support them with some form of guarantee is important. Regulatory certainty also affects issues of timing and risk and so there needs to be some degree of certainty on the approval processes before large investments are made. In the UK, this is being done through the Generic Design Assessment process, prior to construction, and in the US by the Combined Construction and Operating Licence process. Banks also monitor public opinion, but even more importantly, the World Bank, Asian Development Bank and the European Investment Bank are driven by the appetite from their member countries for financing nuclear power projects. It is up to the consortia of countries that are in favour of nuclear power to have more of a say on the banks' boards. This is probably not the best U3O8 chart available but it's the best I could find to put the article recently posted on the PDN thread into context. Maybe some people carry these numbers in their head, but I like to look at a picture. It's news that's almost worth writing home about! Uranium investors will be pleased to note that the uranium spot price showed some signs of life this week. 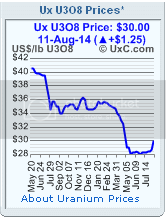 U3O8 prices have managed to claw their way up to $30 for the first time since late spring.